Carl Icahn once again increased his Apple stake, but he continued to rail on Apple's board for failing to increase its return to shareholders. 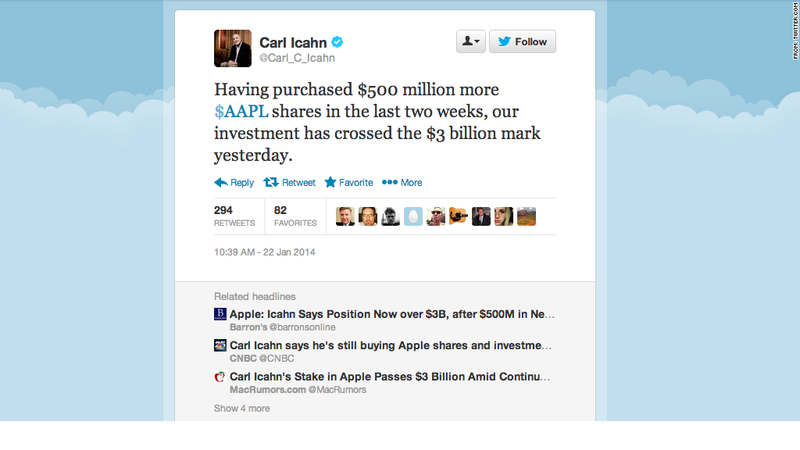 Carl Icahn increased his stake in Apple by $500 million Wednesday, calling the investment a "no brainer." In a series of tweets sent Wednesday morning, the activist investor said his ownership of Apple is now worth more than $3 billion. Shares of Apple rose more than 1%, following the news. His latest purchase didn't stop Icahn from continuing to excoriate Apple's leadership team, saying the company's board of directors "is doing great disservice to shareholders by not having markedly increased its buyback." Icahn has repeatedly urged Apple to buy back an additional $150 billion of its own stock. That request has fallen on deaf ears. Icahn said he will write an "in-depth letter" on the subject soon. He started his crusade to convince Apple to buy back more of its stock in August. Since then, Icahn has upped his stake three times, continuing to praise Apple's business and calling the stock "extremely cheap." At the same time, he has skewered the company for failing to meet his demands. Icahn wasn't the first notable investor to push Apple for a stock buyback. In February 2013, David Einhorn of Greenlight Capital publicly slammed the company for "hoarding" billions in cash. After the company announced its buyback plan three months later, a mollified Einhorn promptly increased his Apple stake. In a letter to investors on Wednesday, Einhorn revealed that Apple remains one of his largest stock holdings, where he is betting that the stock will increase in value.